Air Force photograph by Samuel King Jr.
Tech. Sgt. 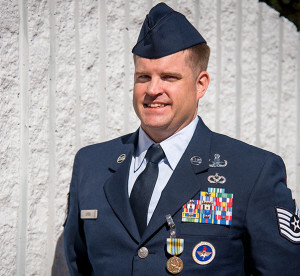 Phillip Dyer, an explosive ordnance disposal instructor, received an Airman’s Medal March 9 at Eglin Air Force Base, Fla. Dyer, 366th Training Squadron Detachment 3, received the medal for heroism after saving a double-amputee from hypothermia and drowning in 2015. In total darkness, with temperatures only in the high 30s and in the midst of a monstrous rainstorm, Tech. Sgt. Phillip Dyer waded into rapidly-moving, chest-deep-and-rising waters to save a trapped, flood victim on the verge of hypothermia and drowning. That is how the explosive ordnance disposal instructor spent the night after Christmas 2015. Dyer, 366th Training Squadron, Detachment 3 at Eglin Air Force Base, Fla., was recently awarded the Airman’s Medal for his heroic efforts on that day. Dyer was in rural Missouri visiting his older brother and family when the torrential rain began. The rain would eventually flood the only road and bridge to and from Dyer’s location. The flooding happened so quickly, it separated Dyer’s wife, son and sister-in-law, who’d gone into town earlier in the day. That afternoon, it was determined Dyer’s family couldn’t return home. Throughout the rest of the day, Dyer and his brother checked the road and the bridge, above the flooded creek, to see if it was passable. At around 8 p.m., the brothers discovered a vehicle washed off the road and half submerged in the flooding waters. “The only thing keeping it from washing away was an old barbed-wire fence,” said the 37-year-old Fort Walton Beach, Fla., resident. 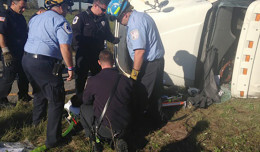 The driver of the vehicle struggled through the current to get to his wife, Christi, who was a double leg amputee. The scene was visible only by Dyer’s vehicle headlamps on bright, the solitary visible light source around. The husband got Christi out of the vehicle and onto their roof. The man, in his 50s, looked exhausted from the effort, according to Dyer. The brothers were told by the 911 operator that due to their location, it would take paramedics and rescue an hour and a half to reach them. Christi had been in and around the cold, rushing water for approximately 15 minutes at that time. “In an hour and a half, she would be hypothermic or washed away,” said the 17-year Airman. Brig. 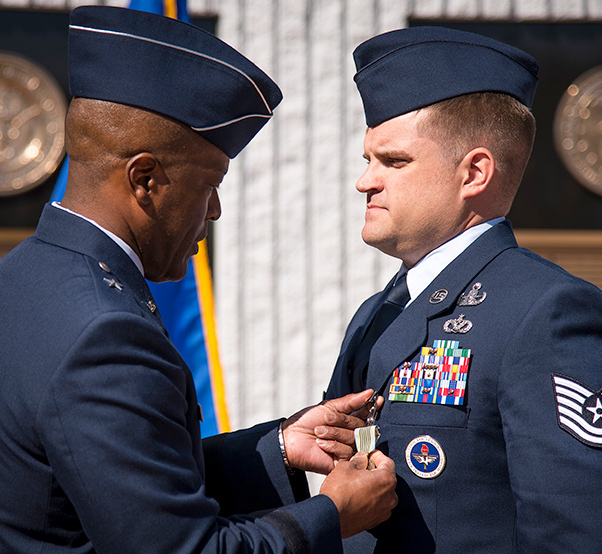 Gen. Ronald Jolly, 82nd Training Wing commander, pins the Airman’s Medal onto Tech. Sgt. Phillip Dyer, during a presentation ceremony March 9 at Eglin Air Force Base, Fla. The husband and another man on the scene tried to rescue Christi, but could not carry her above the water. With the waters rising toward the couple’s roof and no chance to tow the vehicle without possibly losing his own, Dyer made a call. When Dyer reached Christi, he said she was very cold and turning blue. The Airman took her from the two men and used a fireman carry to get her through the close-to-freezing current to a less, deeply flooded area. Then Christi began to panic. As this point, Dyer said much of his military training took over. 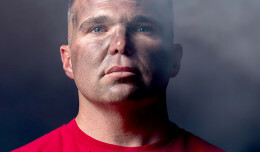 The self-aid buddy care, combat life saver, operational risk management and his own EOD technician composure allowed him to accomplish the specific mission he had before him. 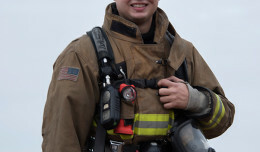 “My training helped me stay calm in a torrent of rushing water, pouring rain and darkness not knowing when the situation could go from bad to worse,” he said. He quickly briefed the two men, who’d attempted to rescue Christi earlier, on how to perform a chair carry. At this point, Christi was so weak, she couldn’t hold herself up. One man held her back, while Dyer and the other rescuer performed the carry to remove her from the current and get her to safety. Tech. Sgt. Phillip Dyer salutes Brig. 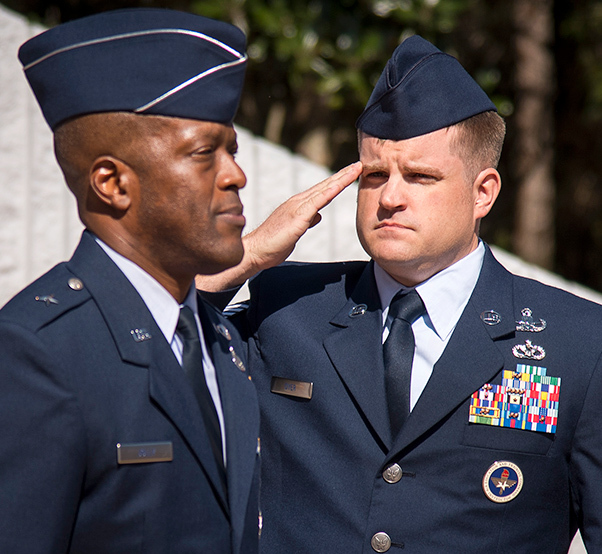 Gen. Ronald Jolly, 82nd Training Wing commander, during the playing of “To the Colors” at a medal presentation ceremony March 9 at Eglin Air Force Base, Fla. They immediately wrapped her up in a blanket and tried to warm her up. Christi and the rescuers went back to Dyer’s brother’s home to wait on the emergency responders. When rescue personnel arrived, they said Christi’s vehicle was totally submerged by the water. The water would rise another eight feet before subsiding. The following day, Christi’s son visited Dyer and personally thanked him for saving his mother’s life. Dyer set aside the event as something that just needed to be done. He wrote it up as just another good enlisted performance report bullet. His former superintendent, retired Chief Master Sgt. Martin Cortez, saw the potential in the act and began the process to get Dyer recognized for his heroism. He received that recognition March 9. “It is amazing to see him finally honored and I couldn’t be prouder,” said Cortez, who attended the ceremony. Dyer’s brother, John, who couldn’t attend the ceremony, also added praise for his brother and all military members. “If this is even a small cross-section of the type of men and women serving our country, we should all be proud,” he said. With the recent medal presentation and recognition, Dyer reflected on the moment and his decision. Find out where to pick up a print copy of Aerotech News & Review by checking our Distribution List. Aerotech News and Review is published every Friday serving the aerospace and defense industry of Southern California, Nevada and Arizona.